Cause There are several virus and virus-like diseases of pear. In some cases the exact cause or even virus has not been determined. Different described diseases may be due to the same virus. 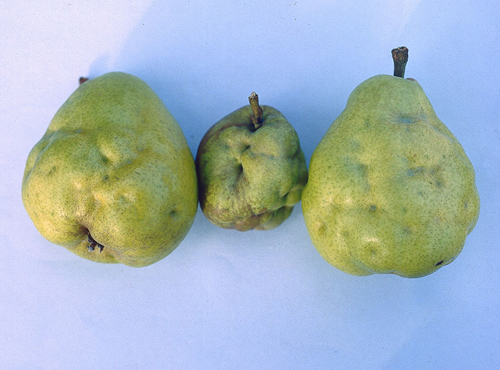 The following are reported to occur on pear and include Apple chlorotic leaf spot virus, Apple mosaic virus, Apple stem pitting virus, Apple scar skin viroid, Pear blister canker viroid, Peach latent mosaic viroid, and Candidatus Phytoplasma pyri (decline). Some viruses severely reduce tree growth and fruit production. Trees that have been tested and found free of all known viruses show more vigor and growth and come into production sooner than diseased trees. Virus spread is believed to be only through affected scion wood. There is no evidence to suggest a "natural" spread-by insects or other vectors-in orchards. Decline, however, is spread by the pear psylla. Symptoms Viruses reduce tree vigor and production and sometimes cause fruit malformation, such as with stony pit, or leaf symptoms. Use clones that have been tested and found free of all known viruses to produce nursery stock and to top-work virus-free trees. References Hadidi, A., Barba, M., Candresse, T., and Jelkmann, W. 2011. Virus and Virus-like Diseases of Pome and Stone Fruits. St. Paul, MN: APS Press. Németh, M. 1986. Virus, Mycoplasma and Rickettsia Diseases of Fruit Trees. The Netherlands: Martinus Nijhoff Publishers.